I am sure this recipe will change any prejudices ;). Using meshed bananas to give a natural sweet to the porridge, vanilla bourbon extract and cinnamon to give extra note to it makes a creamy and delicious porridge. It is perfect for breakfast as it gives you energy, regulate appetite and it’s easy to digest. Eating porridge each day could protect the heart against disease, Harvard University has found. Sprinkle it with pomegranate, few chopped pecans and enjoy! Put ground oatmeal, ground pecans, coconut blossom sugar, cinnamon, vanilla bourbon extract in a cooking pot and mix it. Add milk to it and mashed bananas. Cook and stir the mixture till you get creamy mixture (approximately 5min). 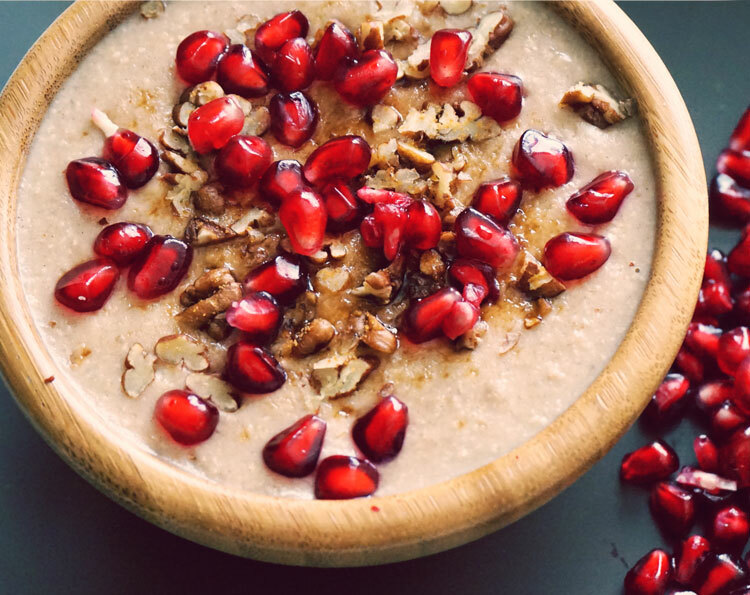 When is finished pour the porridge in a bowl and sprinkle it with pomegranate and few chopped pecans!